Here is the best Astronomy DVD set based on precise NASA and ESA data. It contains a professional 3D space-simulator app that displays the current positions and orbits of the planets and other celestial bodies in real time. This app is called "3D Astronomer™." It uses a copy of the Hipparcos Catalog, a database of highly accurate data compiled by ESA (European Space Agency), and performs calculations to display the said positions and orbits based upon the current time setting of your computer. When you run the application, you'll see a realistic simulation of the Universe. Accurate positional data of celestial objects, their motions, and real astronomy images make the simulation very realistic. You can view a planet from different positions and distances in outer space, so that you get a complete picture of the whole planet. Pictures taken by the Hubble Space Telescope and NASA's deep space probes enable you to view the surfaces of the planets and their moons, the surfaces of near-Earth asteroids, and highly-magnified, high-resolution views of far away stars and galaxies. The space simulator app enables you to take a virtual trip around the Solar System, and beyond the Milky Way galaxy. You'll be able to explore the Universe in a spectacular three-dimensional view. You can simulate a hyper-speed voyage into outer space and travel to a distant world. You'll even be able to view the Universe as it might have looked in the past, or as it might look in the future. You'll discover distant worlds; worlds that most people don't even know exist. The application is used by astronomy enthusiasts, professional astronomers, and astrophysicists. In spite of its sophistication, it is extremely easy to use, which makes it suitable for all age groups and skill levels. It is ideal for both education and fun. You can also gift the DVD set to someone you love. Exploring outer space and learning about the Universe has never been as exciting as this. Whether you are a professional astrophysicist or a school student, this astronomy DVD set will amaze you. Between 1989 and 1993, Hipparcos (or "High precision parallax collecting satellite"), an astronomy mission of the European Space Agency (ESA), collected data about the accurate positions, motions, distances, luminosities, and other attributes of stars and other celestial objects. In 1997, ESA published the Hipparcos Catalog, which pinpointed the positions of more than 100,000 stars with a very high precision. 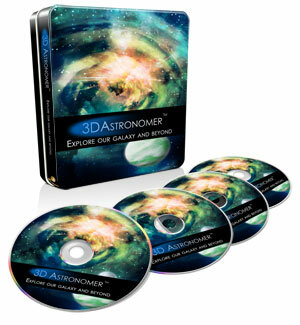 This astronomy DVD set contains a database based on the Hipparcos catalog, and a powerful professional space-simulator application called '3D Astronomer™' that works on this database. It'll enable you to explore the Sun, the Moon, all the planets of the Solar System, the moons of those planets, 3840 near-earth asteroids, comets, extrasolar planets, 100,000+ stars, red giants, white dwarfs, and many astronomical phenomena such as eclipses, etc. on the monitor of your laptop or computer. A downloadable type that you can download directly from the Internet within a few minutes from now. A physical type that consists of a set of 4 DVDs. It will be delivered by post to your address. N.B. The upgrades and updates of the application are 100% free for lifetime. It also has a no hassle, 60 day money back guarantee. No questions asked! Copyright © AstronomyDVD.com. All Rights Reserved.